Can Japan succeed in stimulating its economy to growth? While Japan is technically democratic, there is an element of bureaucracy within their power structure and a revolving door of prime ministers which makes key reform very hard to achieve. 1. Monetary easing – aiming to lift inflation but keep bond yields low, this reform intends to allow the government to reduce its debt burden in real terms. 2. Tax hikes – intended to help relieve the terrible fiscal situation the government finds itself in. Many believe that the hit to growth will cause the effect on the government’s purse to be limited at best. In fact the newly delayed tax hikes would only have a less than 1% effect on total debt over 10 years once growth impacts are taken into account – a negligible amount when government debt sits at more than 200% of GDP. 3. Structural reform – proposed to drive growth and productivity. Some say this will only affect the supply side of the economy where so much excess capacity already exists. The argument that demographics is causing the deficit in aggregate demand is also hard to refute, meaning that none of these ‘arrows’ will be able to hit their target. The demographics problem is from a combination of two things – a shrinking working age population supporting a growing aged population. This dynamic reduces demand and growth, and destroys budgets in more states with a more democratic socialist stance such as Japan. Real exports are finally showing some growth as the benefits of the depreciation in the currency come through. While Japan has always had a comparatively low unemployment rate, labour market conditions are strong and are pointing towards wage settlements coming off their lows. However, the longer-term fact remains that a falling working age population means domestic demand will be constrained, resulting in a reliance on external demand to drive growth and inflation at home. This will be tough with the likes of the Koreans and even the Chinese pushing higher up the value chain into the space dominated by Japanese firms, intensifying competition. What if Abenomics doesn’t work? In the case where Abenomics fails to lift inflation and Japan continues to be stuck in deflation or a debt crisis occurs through an issue with the external accounts, one option remains for the Bank of Japan and that is to simply cancel all of the Japanese Government Bonds (JGBs) it has bought over the years. In a few years’ time the Bank of Japan easily may have amassed an amount of JGBs that total something around 100% of GDP, putting a very meaningful dent into the outstanding stock of JGBs and putting the government in good fiscal standing almost overnight. While the current program of quantitative easing isn’t extraordinary in the face of what other central banks have done, having a central bank forgive the debt of its government would be, and it would be impossible to tell what the ramifications of such an event happening would have on Japanese and indeed global markets. 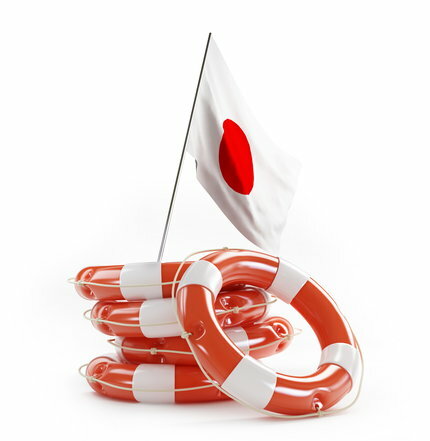 The story from the Bank of Japan is clear though – stay short yen, long JGBs and long equities. At least until the music stops.